Chitwan- Pokhara tour is an astounding tour package in Nepal. 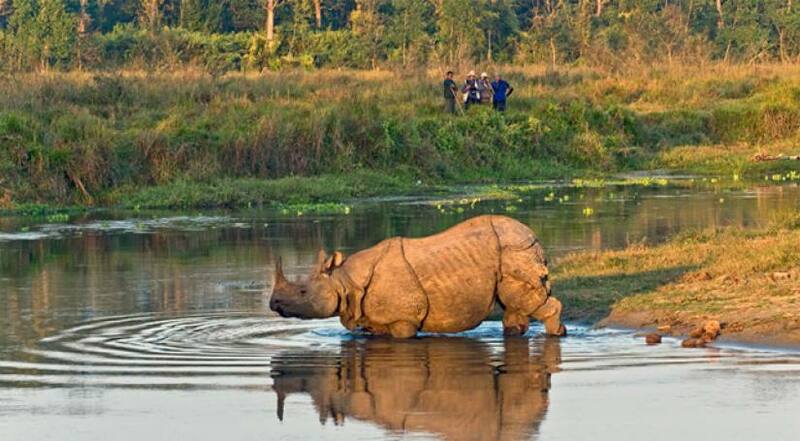 First, we go to Chitwan National Park, a UNESCO World Heritage site and protected are which is abode to thousands of species wildlife, birds and reptiles. We enjoy jungle safari, jungle walk, canoeing, bird and crocodile watching, Tharu cultural show at Chitwan. Next, we go to Pokhara. Pokhara is considered as a naturally blessed destionation. Pokhara owns serene lakes, natural water fall, holy caves and temples. Seti Gorge, Phewa Lake, Begnas Lake, Davi's Fall, Barahi Temple, Talbarahi Temple, World Peace Pagoda and Sarangkot are popular places to visit in Pokhara. We also can experience the thrills of adventure of Paragliding in Pokhara. Pokhara offers us mesmerizing mountain views inlcuding Annapurna Massif, Machhapuchhre( Fishtail), Manaslu and Ganesh Himal. Spending 2 nights to one week in Pokhara will be a magnificent experinece. Strolling at the lakeside, having favourite cushine at restaurant, enjoying spa and massage, collecting souveniers etc are popular activities in Pokhara. After breakfast, we will drive out of Kathmandu valley. The road snakes through the scenic mountainous region with Himalayan backdrop to Chitwan. On reaching Chitwan you will be greeted by the hotel representative will hand you the full schedule of the activities that you will be doing throughout your stay in Chitwan. 04 Days A full day Pokhara Sightseeing tour. Accommodation in 4 Star Category Hotel in Pokhara (Mount Kailash Resort or similar category) and in Chitwan (Hotel seven star or similar) in twin sharing bed and breakfast basis. Guided sightseeing tour and Pokhara valley with private vehicles. Lunch and Dinner while you are in Pokhara (Meal costs about 3 -7 dollars per item depending on the place where you eat). Rob and I would like to express our thanks to Luxury Holidays Nepal and your team for making our trip to Nepal lifetime memorable. We had a great time in Nepal and were perfectly matched with our other tour members. We are looking forward to be back soon. Luxury Holidays Nepal provides you 4 star hotels in Chitwan and Pokhara. If you want the luxury accommodation of 5 star then contact us for cost detail. In Pokhara, you will be staying at Hotel Mount Kailash Resort or Similar category, In Chitwan Hotel Seven Star or similar category.